You're Supporting Bethany Lutheran Primary School (Raceview)	What would you like to buy? We have registered with SchoolBuy to raise money for the school whenever you go shopping online. SchoolBuy has partnered with 200+ online stores including great brands like Booktopia, David Jones, Expedia, Priceline, StrawberryNet and many more. 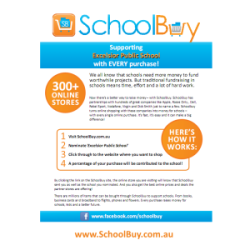 Every time you shop online with one of these stores, a financial contribution is generated for our school - just visit http://www.schoolbuy.com.au/ first, select 'Bethany Lutheran Primary School (Raceview)' on the home page and then go shopping and your favourite stores! Badge links copied from this page will go straight to Bethany Lutheran Primary School (Raceview). For badges that link to the home page, see the general marketing page.